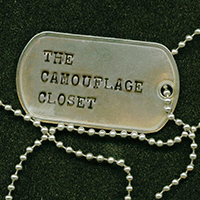 "The Camouflage Closet" is a Veteran-led film about Lesbian, Gay, Bisexual, and Transgender (LGBT) Veterans' experiences with PTSD, trauma and recovery. This project incorporates the firsthand perspectives of LGBT Veterans, who were provided with cameras, tools, and training to create video narratives. Interested in screening the film? Contact us using the form below! "The Camouflage Closet" comes to Denver for four screenings at the Denver VA, sponsored by the LGBT Employee Committee and LGBT Veteran Care Coordinators. Listen to an hourlong podcast with the organizers about the film and LGBT care at the VA: "Rocky Mountain Short Takes" podcast. A special screening of "The Camouflage Closet" at the USC Suzanne Dworak-Peck School of Social Work included a panel Q&A with the director, producer, and Veteran advocate Victor Fehrenbach. "The Veterans Film Festival presents an annual program that showcases the human experience of our serving and ex-serving military personnel and their families." UCSD School of Medicine presents The Camouflage Closet, followed by a Q&A panel of local LGBTQ Veterans for a post-screening discussion with the audience. A special Veterans Day screening of the Camouflage Closet will be hosted by Bryn Mawr's LGBT Focus Group. This event is hosted by the GWU Colonial Health Center and GW Veterans, whose mission is to serve military affiliated students at the George Washington University. This event, held in collaboration with Veteran and Psychology student groups at Palo Alto University, will feature a panel discussion with the director, producer, and Veteran filmmakers. Refreshments will be provided. Join Catharsis Productions, Equality Illinois, and American Veterans for Equality for a free screening of The Camouflage Closet in honor of Veterans Day! The Camouflage Closet will screen at Stanford School of Medicine, with a discussion led by Dr. Audrey Shafer of the Arts, Medicine & Humanities Program. The event is free and open to the public, and refreshments will be provided courtesy of the Office of Medical Student Affairs. The Camouflage Closet comes to Boise State University for a free screening and a discussion period following the presentation. For more information about the screening, check out their event listing! SJSU’s LGBT Resource Center and VITAL Initiative present The Camouflage Closet in this two-hour event that is free and open to the public. The film will be followed by a panel discussion with Veterans featured in the film, along with the director and producer! The Camouflage Closet returns to one of the places where it all started—Stanford University. Join us to screen the full cut of the film, a presentation by the production team, live musical accompaniment of the original score, and a panel discussion with Veterans featured in the film! The Camouflage Closet will have a featured 90-minute slot that will include a screening of the film, a synopsis of current LGBT Veteran research, a description of the VideoVoice method used to create the documentary, and a panel discussion with Veterans featured in the film. Join us at GLMA's 31st Annual Conference in Denver, CO for a co-presentation with two other exciting VA PaIo AIto endeavors: "The Post-'Don't Ask, Don't Tell' VA: Innovative health and social support services for LGBT Veterans." The Camouflage Closet made an appearance at a presentation given by Heliana Ramirez, LISW at the American Psychological Association's 2013 convention in Honolulu: "Evidence Informed, Diversity Responsive and Culturally Relevant LGBT Veteran Practice." "The Camouflage Closet" made its international debut in Mexico City on June 28—incidentally, Pride Weekend—as "El Armario de los Armados." At Espolea, an NGO whose work covers the areas of mental health, substance abuse, and sexual diversity, the film was presented to an audience of activists, psychiatrists, researchers, and more! National Queer Arts Festival: Join us for a director's cut of the film—complete with live music performance, a panel discussion with the Veterans featured in the film, and a free reception! Tickets are on a $10-20 sliding scale, but no one is turned away if this cost is prohibitive. Proceeds will go toward program costs, the Queer Cultural Center, and programs for LGBT veterans in the Bay Area. Michael Nedelman is a journalist specializing in health and medical stories. Currently a producer at CNN, he also served as the digital producer for ABC News' Medical Unit. Previously, Michael worked on public health campaigns at the World Health Organization in New Delhi and the Mount Sinai Medical Center in New York City. Michael is a medical student at Stanford, and he holds a B.A. in Film Studies from Yale. Heliana Ramirez, LISW is a clinical social worker at VA PaIo AIto and a PhD student at the UC Berkeley School of Social Welfare. She has worked with Veterans for the past nine years as a health science researcher and community-based case manager addressing issues of mental illness and substance use. Although this Veteran-led project is not considered research or clinical intervention, her past work with new media includes the use of video in public health and digital storytelling as a mental health intervention. Andrew is a composer of acoustic concert music whose pieces have been performed in festivals and concerts around the world. He earned degrees and institutional fellowships from Yale University and the USC Thornton SchooI of Music and is currently pursuing a PhD in music composition at UC Berkeley. He serves on the faculty of The Crowden School in Berkeley and is a 2015-16 recipient of a Fulbright Research Grant for study at the Universität der Musik und darstellende Kunst Graz in Austria. This project would not be possible without generous support from the Stanford LGBT Medical Education Research Group (MERG); the Stanford School of Medicine's Office of Diversity and Leadership (ODL); the Arts, Humanities & Medicine Program (Stanford Center for Biomedical Ethics); the Stanford Arts Institute Spark! Grant; the Queer CulturaI Center; the Zellerbach FamiIy Foundation; and the UC Berkeley Center for New Music and Audio Technology. See the film, find out how to learn more, and visit us on Facebook!